Moves Like Jagger by Maroon 5 is a great song for learning how to strum freely with the right hand. It is not an easy strumming pattern because the tempo is high and very syncopated (lots of playing off the beat), but it’s worth the effort because it will teach you how to strum with an efficient technique and make lots of other strumming patterns feel quite easy. The chords are really simple, there are only two for the whole song, which is typical of dance music. In this respect it’s a good example of how rhythm is usually the most interesting part of music. 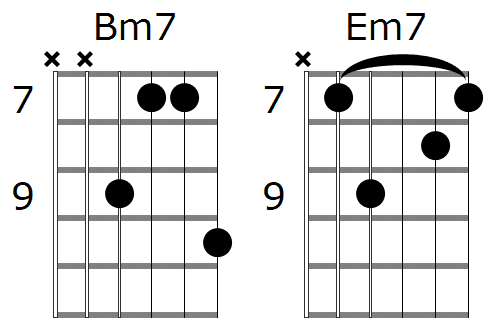 Play the strum pattern 4 times on each chord in alternation. There are 4 beats to the bar. first practice just strumming so that you just hit the strings on ‘1 e + a 2’ and then miss the strings for the rest of the bar. Work this up so that you are only really aware of hitting the strings on the numbers 1 and 2. Use a drum backing track to keep your rhythm tight. Just do the 1st beat work lots of times – count out loud until it’s easy, then just play it by feel. Join the first two beats together, play slowly at first, counting out loud. Gradually allow the speed to increase. Do the same for beats 3 and 4. Now try the whole bar, slow down where you need to to give yourself time to think. Next play the whole bar slowly at a constant speed. Increase the speed up to the song tempo. Try dancing at the same time – harder than you’d think, so don’t wait until you’re on stage!